Plunge The Depths, under jockey Ricardo Aguirre, posting the top qualifying time for the Sam Houston Maiden Classic on Thursday's opening night card. 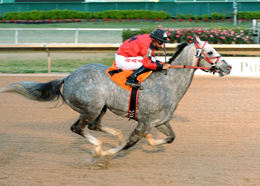 HOUSTON, TX�MARCH 28, 2013�Julia Cesar Ramirez' Plunge The Depths crushed the field by three lengths in the opening trial Thursday, getting the fastest qualifying time for the Sam Houston Maiden Classic on the race park's 2013 opening night Quarter Horse card. The 10 fastest qualifiers from the seven trial races will return to Sam Houston Race Park on Friday, April 12, and vie for the winner's portion of a $65,000-est. purse for 3-year-old and up maidens at time of nomination. After being hard to load prior to the start, Plunge The Depths broke on top and extended his lead, under jockey Ricardo Aguirre, to finish three lengths in front at the wire while completing the course in :17.849 seconds into a 15 mph headwind. The lightly raced 4-year-old son of world champion WAVE CARVER was making only his sixth official lifetime start. Willie J. Simien, Jr. conditions the Joe Kirk Fulton Texas bred from the Strawfly Special mare Miss Manolo. For the complete list of finalists, times, sires, dams, owners, breeders, trainers and jockeys to the 2013 Sam Houston Maiden Classic CLICK HERE.